Seppuku, Hara Kiri. Ritualized suicide. Japan. Home » Seppuku, Hara Kiri. Ritualized suicide. Japan. The Tycoon’s messengers’s reading the sentence. Seppuku. Ritualized suicide in Japan. Seppuku (jap. 切腹) is a ritualized type of male suicide, which was spread around the middle of the twelfth century in Japan within the shift of the samurai and was officially banned in 1868. A man who had lost face because of a breach of duty, could restore his family’s honor by seppuku. The term Harakiri of hara, belly, and kiru, intersect – reverse order of kanji characters is used mainly in Europe and America. Other names were Kappuku, “Slashing the Belly”, Tofuku, “Battles of the belly,” Isame Fuku “Suicide in protest against a decision,” Junshi, “follow in death” (with followers who followed their lords to death), and Keikei , “bedroom punishment” for the court nobility. 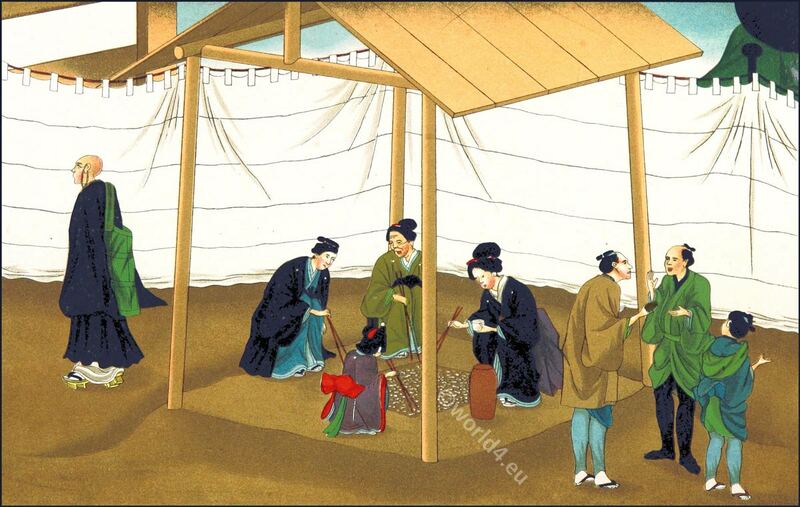 With the beginning of the Meiji restoration in 1868, Seppuku was generally banned in Japan. Although we have long been aware of the existence of this peculiar mode of suicide, the exclusive policy of the Japanese has placed insuperable difficulties in the way of obtaining accurate information concerning it. A more enlightened policy is now gaining ground in the country. The chromo-lithographs that illustrate these ‘Sketches’ are sac-similes of paintings by native artists, selected from a series lately published at Yeddo, and sold to foreigners with the connivance, if not by permission, of the authorities; for the spy system in Japan is so perfect, that illicit dealings are next to impossible. 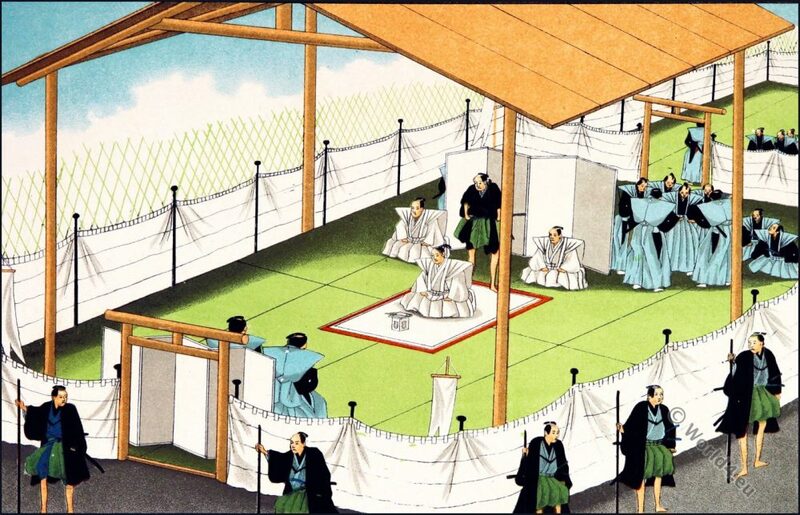 As Japanese punishments entail disgrace on every member of the culprit’s family, the seppuku ‘Hara Kiru,’ or ‘happy dispatch,’ which is the only exception, is regarded as a great privilege by the classes entitled to avail themselves of it. These consist of the nobility, military, and officials of a certain rank holding civil appointments. It seems to be a prevalent idea that this sacrifice is reserved for political offences; but this is not the case, as crimes of all descriptions are condoned by it. A simple act of suicide does not constitute the seppuku ‘Hara Kiru.’ To render the act legal, and to ensure the heir and family of the person performing it against disgrace and loss of property, an order for its performance must be issued by the Tycoon, or by the suzerain prince of the culprit. 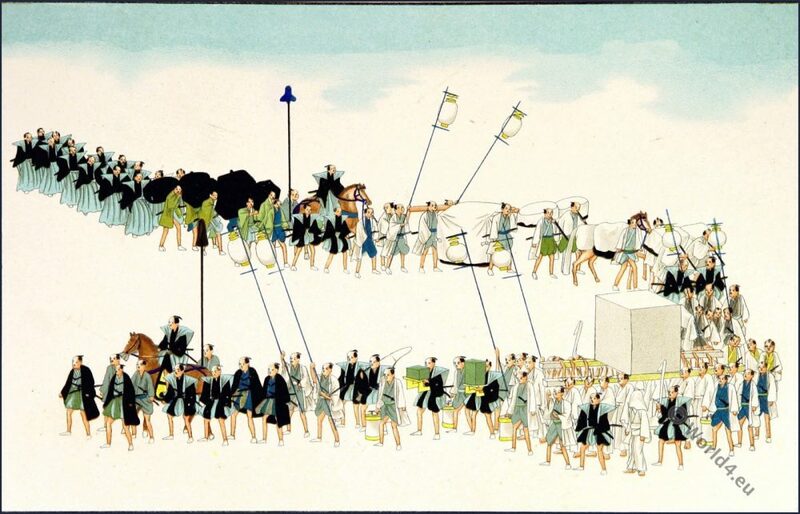 The Japanese, being a high-spirited and patriotic people, consider that death under any circumstances is preferable to dishonor; and the privileged classes always carry about with them when they travel the paraphernalia used at the performance of the seppuku, in token of their readiness to prove their patriotism, or to die rather than disgrace their family. The dress consists of a robe and ‘harakama,’ or ‘winged official dress,’ of coarse white cloth— white being the funeral color of the country— which is undistinguished by the crest or any sign of the rank of the owner. There is also the disembowelling knife, the blade of which is about eight inches long, and very sharp. When the sentence of the ‘Hara Kiri’is awarded, or the humble request of a defeated politician to perform it is acceded to, a formal document is made out and duly signed by the competent authorities. It is then delivered to two commissioners, by whom it is conveyed to the culprit. Should the proposed victim be a Daimio of importance, and sufficiently powerful to set the Tycoon at defiance, the delivery of the imperial mandate is likely to be attended with unpleasant results, as the bearers are sometimes waylaid and murdered by retainers of the doomed prince, and have frequently to resort to stratagem to accomplish their task. But when once the mandate is delivered, the prince must submit, or he would lose caste even with his own followers, so strongly are the Japanese imbued with respect for the ancient customs of their country. The accompanying illustrations represent the different formalities that are observed at the performance of the seppuku by a Daimio. On receiving the official intimation of his sentence, he orders the necessary preparations to be made, and informs his friends and relatives of it, inviting them to share in a parting carouse with him. On the appointed day, after taking a private farewell of his family, he receives his friends. He is habited in his white robes, and supported by two of his relatives or ministers, similarly attired. When the time arrives (which is previously arranged with the commissioners) he takes leave of the guests as on any ordinary occasion, and enters the screened enclosure, accompanied by his supporters. It will be noticed, that the retainers guarding the exterior and entrance are barefooted, which is a mark of respect in honour of the rank of the culprit, and of the solemnity of the occasion. The Tycoon’s messengers then read the imperial mandate, which proclaims that, in accordance with the ancient custom of the country, the Daimio is permitted honorably to sacrifice himself for its benefit, and thus to expiate in his own person the crime or offence he has committed against the welfare of the state. In the illustration, the two officials charged with this disagreeable office are sitting opposite the Daimio and his friends, reading the fatal document, their suite surrounding them in respectful attitudes. The whole party wear the official dress, which intimates at once the respect due to the victim and the official nature of the ceremony. The second scene shows the Daimio on the point of performing the sacrificial ceremony. His forelock is reversed, as a sign of submission to his fate, and to assist the executioner, who, as soon as his master goes through the form of disembowelling himself with the knife on the stand, will, with one blow of his razor-edged sword, complete the sacrifice by decapitation. Only the two chief commissioners appointed by the Tycoon, and the sorely-tasked supporters of the victim, remain to witness the last act of the drama. The rest of the party await its completion in the adjoining compartment of the enclosure, which is expressly constructed for that purpose. The funeral procession, which is the subject of the next scene, is accompanied by all the pomp indicative of the high position of the deceased. 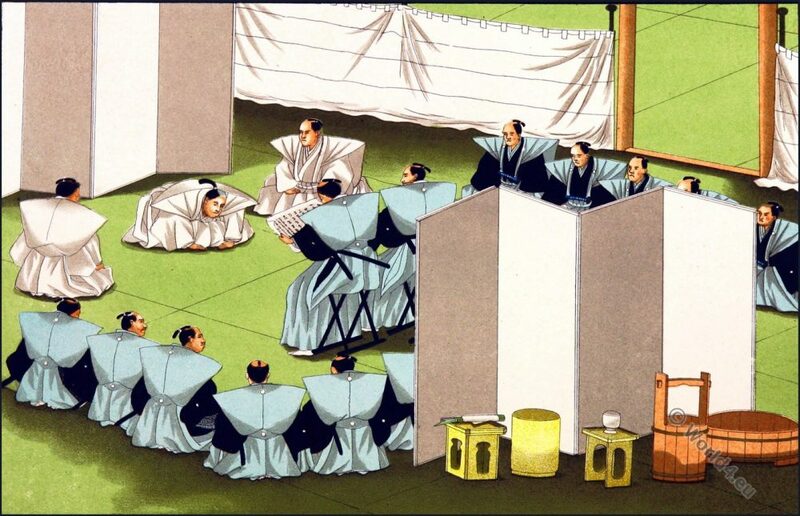 The mourners wear robes of white cloth, and all the feudal paraphernalia are draped with the same material; which, as before mentioned, is used in Japanese mourning. The coffin is carried near the head of the procession: it is a square box of resinous wood, covered over with white, and the body is placed in it in a sitting posture. All the members of the family attend the funeral, either on foot or in norimons. If the wife and the heir be absent in Yeddo, they are represented by the nearest relations. In this instance both are present, from which it may be inferred that the sacrificial act has taken place in the neighborhood of Yeddo. 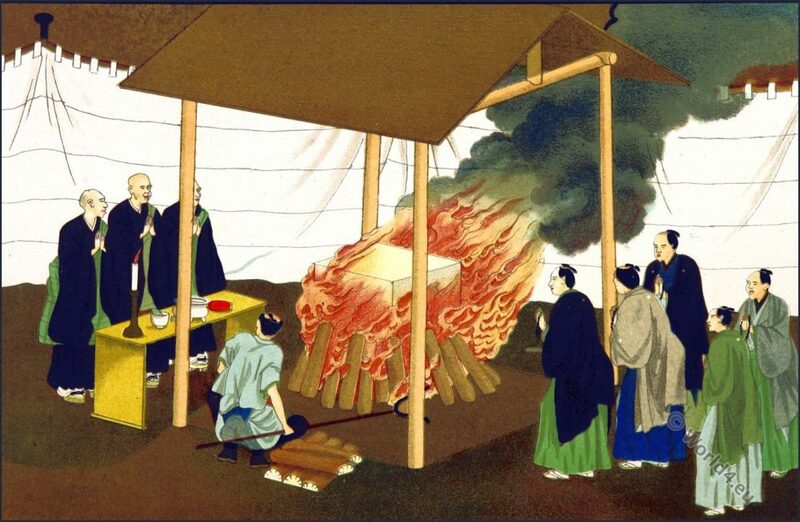 Although the Japanese sometimes bury their dead, they generally practise cremation. Repulsive as this custom is to European ideas, it must be remembered that the Japanese are not singular in preferring it, as several of the most civilised nations of antiquity considered it the most honourable mode of disposing of the bodies of the dead. While the body is being reduced to ashes the priests tell then beads and chant prayers for the soul of the departed, as the followers of almost every religious sect in Japan believe in a state of purgatory. The last scene shows the wife and son of the victim of the seppuku collecting his ashes and depositing them in an earthenware jar. This is afterwards sealed down and conveyed to the cemetery, or temple, which contains the remains of his ancestors. Some of the Japanese cemeteries are very extensive; and they are generally situated in secluded, picturesque spots, in the neighbourhood of the towns and villages. The graves are small, round, cemented receptacles, just large enough to receive the jar containing the ashes. If the body is buried (which only happens when the deceased is friendless, or too poor to pay the expenses of cremation), the head is always placed pointing to the north. The tombstones are ordinarily about three feet high; and are either square or circular in shape, resting on square pedestals, in which small holes are cut to contain rice and water. The supplies of these are replenished from time to time, generally by the women of the family, lest the spirit of the deceased should revisit its grave and imagine itself neglected. Sometimes flowers are placed before the graves, and flowering sprigs of peach and plum are stuck in the ground about them. Like the Chinese, the Japanese burn joss-sticks to propitiate the deities in favour of their departed relatives; and the neighbourhood of a graveyard may generally be detected by the peculiar aromatic odour emitted during the burning of these. For some time after a funeral the relatives daily visit the tomb and intercede for the dead, holding their hands up in the attitude of prayer, and rubbing the palms together as they mutter their monotonous orisons. Source: Sketches of Japanese Manners and Customs by Jacob Mortimer Wier Silver. ‘Sketches of Japanese Manners and Customs’ were collected during the years 1864-5, by Jacob Mortimer Wier Silver. Lieutnant Royal Marines, light Infantry (Late of the Royal Marine Battalion for service in Japan). Illustrated by native drawings. Reproduced in fac-simile by means of chromo-lithography. Printed by Day and Son, limited, Lithographers and Publishers. London 1867. This entry was posted in 19th Century, Asia, Japan and tagged Traditional Japanese costume on 10/20/16 by world4.